I've been painting Tau Battlesuits this weekend, which feels quite therapeutic, having not painted any of my Tau army for quite a while. I've only done 1 of the 3 twin linked flamer Battlesuits which seem to have featured in countless battle reports for the past few months without every actually being painted. So with my second Warhammer 40K Grand Tournament on the way, I thought I'd better pull my finger out and get my Tau Battlesuits painted. I'm very pleased with this one, because he's probably the cleanest of all my Tau Battlesuit conversions. He's also armed with a fantastic twin linked flamer conversion, which I 'borrowed' from the guy who runs the Advanced Tau Tactica forums. I had to make a few moderations due to not having all of the same components or sheer laziness, but the essence of the design is there. Basically it's a plasma rifle block with the fuel line repositioned, a flamer fuel tank stuck on top and then the front of the Tau flamer with an extra nozzle stuck on the front. Finally a small rectangular chunk of plastic from the bottom of the pulse carbine handle fills out the bottom of the plasma rifle body, bringing it in line with the underlying support strut of the flamer. For painting, I undercoated the gun in my usual Privateer Press Paint "Thornwood Green", applied the highlight (a Thornwood Green/Bleached Bone 70/30 mix), figured out which bits would look better in brown, then painted on two subtle orange stripes. Done! 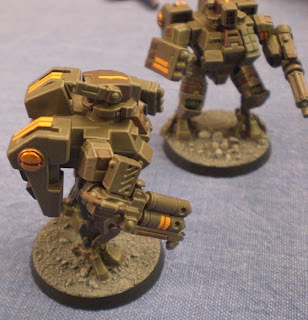 I need to write up a Tau Battlesuit painting guide one day. They are looking great! I absolutely dig the color scheme you've chosen for your Tau! Lovely work as always. Your suits always impress. I can' endorse TL flamer suits, however, as the range of their primary weapon just isn't good for anything Tau. The times I've used them they've been...well, not suicide units per se, but they definately got attritioned down to nothing. I find the points better spent on a team of Deathrains. Side note- I've added 2 Fusion Blaster/Targetting Array/Disruption Pod Piranhas to my 1750 list. 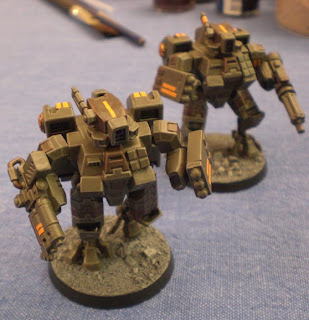 I've had good results using the 'PilotFish' method discussed at Advanced Tau Tactica. Aye, great suits... and I'd *love* to see a painting tutorial from you at some point. I'm sure it'd be eminently useful for more than just myself. I love the scheme you use. Nice one. As always, the painting and colors you've selected look fantastic. Also, the posing of the models looks just great, like the suits are charging into battle. Out of curiosity, are these the Forge World suits or the stock GW variety?